marathon blog 9, shampoo service? This a screenshot from www.tonic-air.jp, which is a novel way of advertising Sunstar tonic shampoo. The site takes you on a virtual business-class flight, where a pretty flight attendant offers you a “shampoo” service. Choose one of three shampoos, then she leans over and scrubs you head. When she’s done, she gets you a towel to dry off. The virtual flight also has a inflight movie, safety instructions, etc., each of which humorously gives you some information about Sunstar tonic. 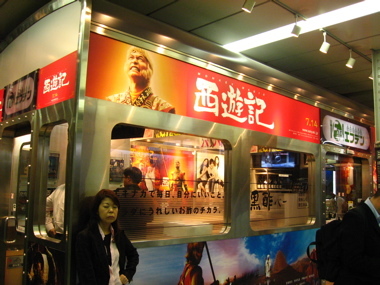 This kiosk on Shibuya station advertises Fuji TV shows, this time it’s a new version of Monkey. Inside, however, there is also a black-vinegar bar. Vinegar drinks, which supposedly helps combat heat as well as aid dieting, have always been popular in the summer. Recently “black vinegar” drinks have become especially popular. I’m not sure if this is because a few black-vinegar bars have opened inside stations, or if the bars have appeared because of the drink’s popularity. Whatever — as someone who once drank so much vinegar her lips turned blue, any excuse to legitimately pickle my insides is fine by me. 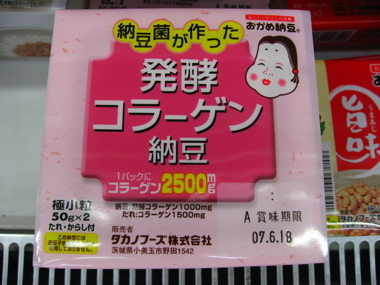 As if fermented, smelly and gooey beans is not enough (this is the kind of stuff that requires a full airing of the apartment and plenty of breath mints…), this pack of natto is also loaded with 2500mg of collagen. I actually like natto, but let’s face it, no amount of collagen is going to make me more attractive when my breath smells of manky socks. Perhaps it’s because of the falling birthrate, but pets appear to be getting an elevated status in society. 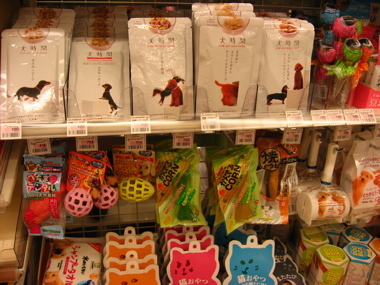 Natural Lawson, the “healthier” (although really, probably just posher) Lawson, now has a fancy range of pet foods, including dog lollipops (top right) and low fat “science diet” chow. The dried whole fish (below, it got cut off in the photo I’m afraid) even looks like a beer snack for humans. Actually, I wonder if people really can eat them … I know Bandai came out with “Petoy” which was a small rubber toy for the dog that came with a soy milk biscuit snack that both pet and pet owner could “enjoy” together (aaaaaaahhhhh, isn’t that cute? Some might barf, and not because they are really eating dog food). 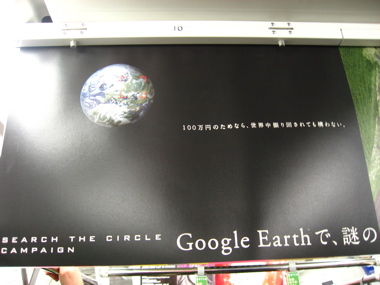 At last a way to make money from wandering aimlessly across the planet on Google Earth! 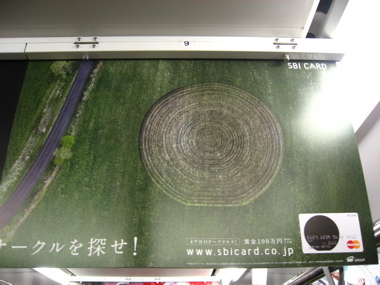 This Japanese sbicard campaign is offering 1000,000 yen to anyone who can find that particular crop circle via Google Earth. Argh, this is really late. 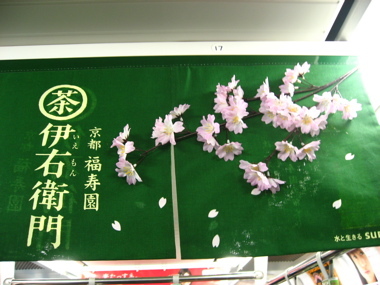 Green tea using plastic cherry blossom on train ads. Of course for cherry-blossom viewing season. marathon blog 3, nice smelling men! 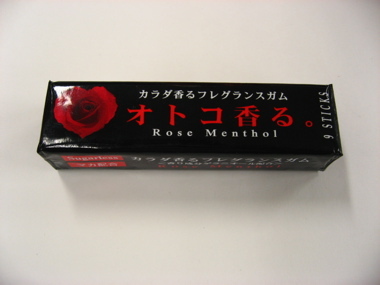 This rose-menthol flavored gum is aimed at men and supposedly not only makes the breath fresh, but the skin fresh. Now any old grubby man can literally smell of roses. There is also a woman’s version of this gum, which comes in smaller pink and lemon yellow packages (what a surprise): rose and grapefruit flavor.